The Hyatt Capital Gate Abu Dhabi offers spacious accommodation and international culinary delights in the world-famous Capital Gate building. The 189 spacious, air-conditioned guestrooms feature flat-screen TVs, mini-bar, and mp3 docking station and offer panoramic views of the city from floor-ceiling windows. Charges apply for WiFi. Savour a variety of international fare at the hotelâs 3 restaurants, including Eastern Mediterranean at the hotelâs signature restaurant. The Rayana Spa offers panoramic views of the city, the only one of its kind in Abu Dhabi, and features a suspended swimming pool and fitness centre. The hotel can cater to any event and parking is available. 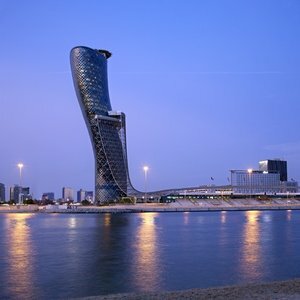 The Hyatt Capital Gate Abu Dhabi is part of the Abu Dhabi National Exhibition Centre (ADNEC), located in the world-famous Capital Gate Building, in the embassy and government district, in central Abu Dhabi. Zayed Sports City is just 4 kms away. Explore the gorgeous Sheikh Zayed Grand Mosque, the 8th largest in the world, only 4.5 kms from the hotel. Yas Island is just 20 minutes away, featuring the Ferrari World amusement park and the Yas Waterworld water park. No charge for children 12 yrs and under when sharing room with parents.